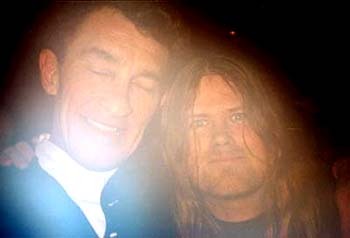 I experienced the best concert in my entire life a few years back: The Tubes live in my home town Gothenburg (actually the gig was in the middle of nowhere on the remote island of Hönö). Pure magic. I became a die hard Tubes fan when was a kid but never got the chance to see them live. After behaving like an embarrasing fan-idiot (a relieving feeling!) after the show, taking photos of myself and Waybill, getting my old records signed, buying posters, t-shirts and the new studio/live album The Tubes World Tour I glanced with sinister eyes on the torn apart trousers, still dangling in the ceiling. With the smile of a greasy car salesman I asked one of the guys working in the club if they possibly could have a ladder stached somewhere nearby. Of course they had, but since they knew I was playing in Freak Kitchen and they, unsuccessfully, had been trying to get us playing in their club for a while, they immediately took advantage of the situation. Damn. 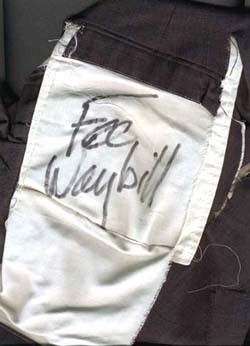 The result: one pair of pulverized trousers, formely worn by a wild American rock singer traded for one Freak Kitchen concert. What a bargain! (Visit the official Tubes site here).